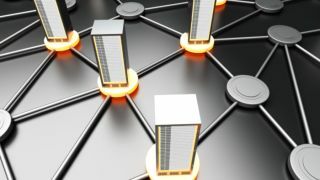 Whatever the economic climate may be in the world, for most small businesses a tight budget is the norm, which means that creating a modern IT infrastructure is not necessarily an easy task But if you follow some simple rules you can make your network the most efficient it can be for the right price. Not having a server works fine until you have about three computers on the network, then it becomes necessary for functions such as storage. A decent server for around £1,000 can service up to 25 users, but then you will need another to act as backup in case the first one fails. Of course, servers can cope with hundreds, if not thousands of users, but these systems can also cost hundreds of thousands of pounds. For most businesses a ratio of one server to 10 users is about right. Don't be fooled into thinking that what works for a large enterprise will work equally well for your small business. If your IT department is a few people, they can do just about any job required. There is no need to have many people with specialist responsibilities when they will end up only doing 45 minutes of work a day. At the other end of the scale, don't be fooled into thinking that the "small business" version of some software you need will be right for you. For some, a company can easily outgrow these versions and you will need to spend more money on getting the right tool for the job. Not so long ago, if someone suggested using a machine that didn't run on Windows, it would be met with derision. But sticking with one platform can leave your infrastructure open to a full scale shutdown should a bad update, hack or virus take out your machines. Monocultures tend to suffer badly like this. It is best to have both PC and Macs as workstations, or even to reuse old machines with Linux running on them to save money. If you have a Windows server, consider buying a Linux-based network attached storage box, so should a software fault knock one out, the other should still keep going. "The network's running slow today!" is a common cry from users, but it could be that poorly matched hardware and software could be to blame, costing your organisation money in lost productivity. The rule here is to spend around 20% of the cost of your server on decent networking equipment. Any less and your network may be slowed down by switches that cannot be tuned up or be unable to move data without high latency. The Dell PowerEdge VRTX is a good example of a system that integrates a Gigabit switch with compute and storage functions, improving network speeds and productivity.